Here we see Beach House. Baltimore’s Dream pop Duo, Alex Scally and Victoria Legrand, joined by drummer Daniel Franz, underneath a sky of mylar diamonds and surrounded at venue 2640, by a church of rapt converts. Beach House had been described to me as Indie rock, shoegaze, Dream pop, and Baroque pop. Prior to their Saturday night show at Baltimore’s 2640 I asked a concert goer next to me how she’d describe their music and she said it reminded her of slow songs at a high school dance for goths. I had to ask questions, I’d never heard their music before. I was excited to hear them for the first time without interviews, without reading a review of their new cd Teen Dream, basically without someone like me telling me what to think. and the hypnotic music of Baltimore’s Beach House. 2640 is a converted Church, so before the show began I was amused to think of them as Baroque Pop, but when they started to play I could see why they’d also been described as shoegaze, and for French-born singer Victoria Legrand it was more like hairgaze as her locks were in her face the whole time. 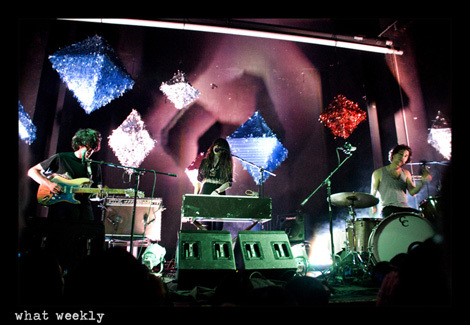 Beach House is a duo consisting of singer and keyboardist Legrand and guitarist, vocalist and Baltimore native Alex Scally on guitar. They hire a third member, in this case, drummer and seeming stunt double for Scally, Daniel Franz, for live shows. I enjoyed the show, the presentation of giant mylar diamonds hung with fishing wire above the stage, and the hypnotic trippy music; it did seem like a dream or dream pop. I may not have seen much of Legrand’s face but I could feel her passion and energy. If a photographer asked me to describe them at their next show i’d probably say they were like Mazzy Star, if Nico was the singer, but people say a lot of things. Caption and photo by Philip Laubner.